Garmin proves it doesn’t just cater for serious athletes with the Vivosmart 4, an everyday wear tracker that can monitor heart rate, blood oxygen levels and energy throughout the day at a relatively affordable price. The Vivosmart 4 was launched at IFA 2018 at the beginning of September 2018. It then hit most markets towards the back-end of the month. At $129.99 (£119.99, AU$199) it’s one of Garmin’s cheaper activity trackers and the latest addition to the Vivosmart line. The only more affordable option from Garmin right now is the Vivofit 4, which we rated highly in our review for its incredible battery life and color screen. But that was much more basic that the Vivosmart 4, lacking both the optical heart rate tracking and Pulse Ox sensor that the new device offers. The wearables currently on the market that the Vivosmart 4 will likely be up against include the Fitbit Alta, which has a similarly slim form factor, but the Vivosmart 4 shares more features with the Fitbit Charge 3 and at £129.99 / $149.95 / AU$229.95 that’s a very similar price point too. 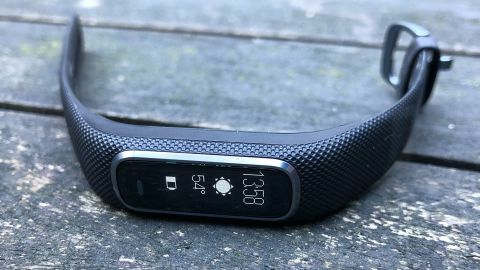 All in all the Garmin Vivosmart 4 may not be a budget tracker, but considering it covers all the features you’d need, it’s packed with some newer sensors and it has the Garmin seal of approval, this is reasonably priced and worth the money. Activity trackers are no longer chunky and just built for the gym. The Vivosmart 4 is a slim fitness tracker that would suit most people for 24/7 wear, especially if you opt for one of the more subtle colors. It has an aluminum bezel around the screen and metal accents, which come in a range of colors. There’s berry with a gold bezel, powder grey with a rose gold bezel, azure blue with a silver bezel and black with a slate bezel. It’s worth mentioning that the silicone strap is built in to the device, which means you do need to spend some time working out which color you really want because you won’t get to switch it out later. Unlike a lot of similar-sized trackers, there’s a traditional watch buckle to keep the silicone strap in place rather than a push-in stud and this is very good news. The push-in fastenings aren’t always reliable, especially during a workout. It also seemingly makes the strap more comfortable. Silicone straps sometimes irritate our wrists, but this one didn’t cause any problems, even when worn all day, all night and for the best part of a week before taking it off to charge. One of the biggest downsides of the Vivosmart 4 is the fact the screen is so small. Sure this is necessary for the device to take on a slim form factor, so we can’t complain too much. But it does take a while to adjust to seeing text half cut off, icons in menus rather than words, and make sense of how to navigate through the interface. The Vivosmart 4 has 5ATM waterproofing, which means you can wear it in the shower and take it for a swim. We found it worked well at the pool, but the smaller screen felt even more difficult to see and interact with when wet. On the rear of the device there’s an optical heart rate sensor, which sits flush against the skin and doesn’t leak too much light out during the night when it’s tracking your resting heart rate (RHR) as you sleep.